I will make this one short and sweet. Since this past December consisted more of eating than anything else, I had very few projects to share. We shopped, ate, decorated, ate, watched fun holiday movies, ate, visited friends, ate, entertained relatives, ate and then we even ate some more. Sometimes we actually ate while doing those things too! Impressed? I’m sure you are beginning to see the cycle of the downfall. Actually, with the Little Guy home 24/7 for two weeks and The Mister around a lot more for a little over three, I was hard-pressed to get much of anything done. And, since they filled the gaps between their work and fun with questions to mommy regarding what will be served at the next feeding time I sort of gave up on any extracurricular crafty activities. Ah, boys, gotta love ‘em! 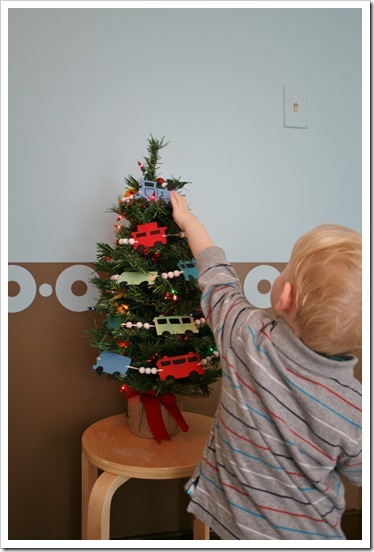 A train-themed Christmas tree for the Little Guy’s room, complete with a handmade train garland. 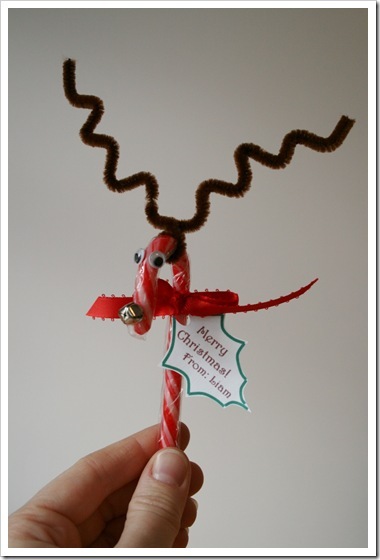 And, who could forget the funny reindeer Christmas greetings that we constructed for my Little Man’s classmates? Although this month feels like it is already flying by, I hope to accomplish at least three projects along the way. We will see how things go, right?